Klippel-Feil syndrome is defined as the fusion of cervical vertebra with associated congenital anomalies but was rarely reported to be associated with Mondini Malformation. 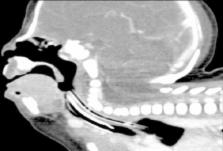 We report a newborn girl with severe neck extension, computed tomography (CT) of the neck after birth showed fusion of the fifth, sixth, and seventh cervical vertebrae, compatible with Klippel-Feil Syndrome and CT temporal bone showed choclear dysplasia with incomplete number of turns that is compatible with Mondini Malformation. Scoliosis and congenital anomalies associated with Klippel-Feil syndrome types I-III. This investigation was aimed at characterizing anomalies and syndromes associated with Klippel-Feil syndrome in a large group of patients. The authors evaluated the clinical and radiographic features, documented the associated anomalies, and registered the type of treatment. The anomalies or syndromes and the development of scoliosis were correlated to the type of Klippel-Feil syndrome. In a cross-sectional study, the authors reviewed data from 57 patients with Klippel-Feil syndrome treated over 25 years at the Department for Orthopedics of the University of Heidelberg. The patients (17 males and 40 females; average age of the first contact, 12 years) were classified into three types according to the description of Feil in 1919. Klippel-Feil syndrome Type I (fusion of cervical and upper thoracic vertebra with synostosis) and Type II (isolated cervical spine) corresponded to 40% and 47% of patients, respectively. Type III (cervical vertebra associated with lower thoracic or upper lumbar fusion) was displayed in 13% of the patients only. The authors found a variety of combinations of Klippel-Feil syndrome and other anomalies in the patients examined in this study, with 67% of the patients characterized by an association with other disorders or syndromes. Of the patients, 70% showed scoliosis. Its degree depended on the type of Klippel-Feil syndrome. Scoliosis in Type I correlated with 31 degrees (Cobb angle), in Type III with 23 degrees, and in Type II with 9 degrees only. Thus, Type II, with isolated cervical fusion, shows a low risk for scoliosis. This study increases knowledge of a wide range of anomalies and syndromes identified in association with Klippel-Feil syndrome. A special finding of the study was a correlation between the degree of scoliosis and Klippel-Feil syndrome Types I, II, and III. Identification and management of high-risk patients with Klippel-Feil syndrome. Patients with Klippel-Feil syndrome are often at high risk for neurological injury. The cervicomedullary junction and cervical spinal cord are especially vulnerable. Twenty-one patients examined and treated over a 20-year period are reviewed. The salient features of the syndrome are identified, and an approach to management is proposed. Background Mutations in SLC26A4 cause Pendred syndrome (hearing loss with goiter) or DFNB4 (non-syndromic hearing loss with inner ear malformation, such as enlarged vestibular aqueduct or Mondini deformity). The relationship between mutations in SLC26A4 and Mondini deformity without enlarged vestibular aqueduct has not been studied in any Chinese deaf population. The purpose of this study was to assess whether mutations in the SLC26A4 gene cause Mondini deformity without an enlarged vestibular aqueduct (isolated Mondini deformity) in a Chinese population. Methods In total, 144 patients with sensorineural hearing loss were included and subjected to high-resolution temporal bone CT. Among them, 28 patients with isolated Mondini dysplasia (MD group), 50 patients with enlarged vestibular aqueduct with Mondini dysplasia (EVA with MD group), 50 patients with enlarged vestibular aqueduct without Mondini dysplasia (EVA group), and 16 patients with other types of inner ear malformations (IEM group) were identified. The coding exons of SLC26A4 were analyzed in all subjects. Results DNA sequence analysis of SLC26A4 was performed in all 144 patients. In the different groups, the detection rate of the SLC26A4 mutation differed. In the isolated MD group, only one single allelic mutation in SLC26A4 was found in one patient (1/28, 3.6%). In the EVA with MD group, biallelic and monoallelic SLC26A4 mutations were identified in 46 patients (46/50, 92.0%) and three patients (3/50, 6.0%), respectively. Also, in the EVA group, biallelic and monoallelic SLC26A4 mutations were identified in 46 patients (46/50, 92.0%) and three patients (3/50, 6.0%), respectively. These percentages were identical to those in the EVA plus MD group. Only two patients carried monoallelic mutations of the SLC26A4 gene in the IEM group (2/16, 12.5%). There were significant differences in the frequency of SLC26A4 mutation among the groups (P 0.5). Conclusion Although mutations in the SLC26A4 gene were frequently found in Chinese EVA patients with and without MD, there was no evidence to show a relationship between isolated MD and the SLC26A4 gene in the Chinese population examined. Hearing impairment in patients with isolated MD may be caused by factors other than mutations in the SLC26A4 gene. Copyright statement: © Aqeel Abdullah Alaqeel et al. Audiological abnormalities in the Klippel-Feil syndrome. Congenital limb deficiences associated with Klippel-Feil syndrome: a survey of 57 subjects. How do the type and location of a vascular malformation influence growth in Klippel-Trénaunay syndrome?